With each passing year, more people around the world are becoming freelancers and solo entrepreneurs. What is the biggest challenge that they’re facing? Freelancers and solo entrepreneurs all have the same #1 challenge: lead generation. So naturally, whenever we talk to freelancers and solo entrepreneurs who use Outfunnel, we want to hear about how they deal with this challenge. Today, let’s look at how Happy Desk manages it. Happy Desk is a one-man web design shop based in Brussels, Belgium that has built sites for clients ranging from cosmetics companies to hotels and restaurants. Kevin Palombo is the founder-CEO of Happy Desk. He handles everything from marketing and generating new leads to personally designing, developing and launching websites for his clients. Needless to say, he is one busy entrepreneur, with a lot on his plate! Kevin’s most valuable skills are in web development, and walking his clients through his elegant 5-step process. To make the most of those skills, he needs to avoid spending too much time on lead generation, and spend as much time as possible doing (1) as he can. However, he can’t avoid doing lead generation work altogether, since you need leads in order to have clients to work with. This is a challenge that every freelancer deals with. How do you address it properly? The current consensus seems to be: one should automate the lead-generation process as much as possible. A central challenge for Happy Desk is to do lead generation in an automated way. How do you get predictable new business scheduled on the calendar? Like any small business owner, Kevin wants to make sure that there is always work ahead. 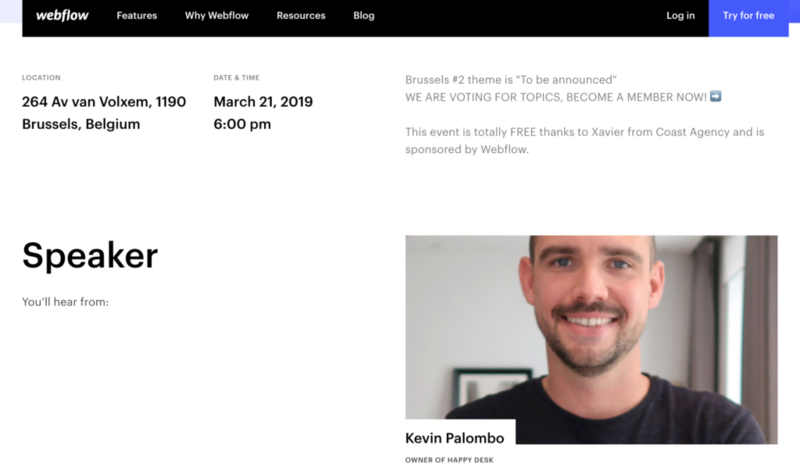 Kevin independently organized Webflow meetups in Brussels, and caught Webflow’s attention – even getting the event sponsored and publicized on Webflow itself! He posts Instagram stories from his personal and business accounts every day. The unique angle here is that bio links to an lnstagram-specific landing page with important links made easy to access from a phone. All of these channels generate traffic. Kevin’s goal is to convert that traffic into leads, and then convert those leads into appointments, demos and ultimately, paying customers. Here are some of the CTAs on Happy Desk’s site. Visitors are able to opt-in to whatever feels most relevant to them. Are you ready to have an appointment? Or would you simply like to learn more about Happy Desk’s method for now? Next, Kevin uses Mailchimp + Outfunnel to setup automated email flows for his leads. When Kevin adds a lead to Pipedrive, a “Deal” is created. If this Deal meets certain parameters (as decided by Kevin), Outfunnel adds that contact into the relevant Mailchimp campaign. Mailchimp then sends a sequence of emails to these leads. I particularly like how Kevin gives you two options – he invites you to schedule a meeting with him, but if that seems too daunting, you can learn more about his method first. If you schedule a meeting, you won’t receive any more emails. If you didn’t click anything, you’ll receive a followup email – and then one final email if you don’t respond to that either. All the data on email opens and web visits are pushed to Pipedrive via Outfunnel, so Kevin can simply look at his Pipedrive dashboard to decide who he ought to be following up with next. Kevin implemented Outfunnel a few months ago to integrate his Mailchimp and Pipedrive. It’s running, and it “just works”, so much so that he doesn’t even have to look at it. 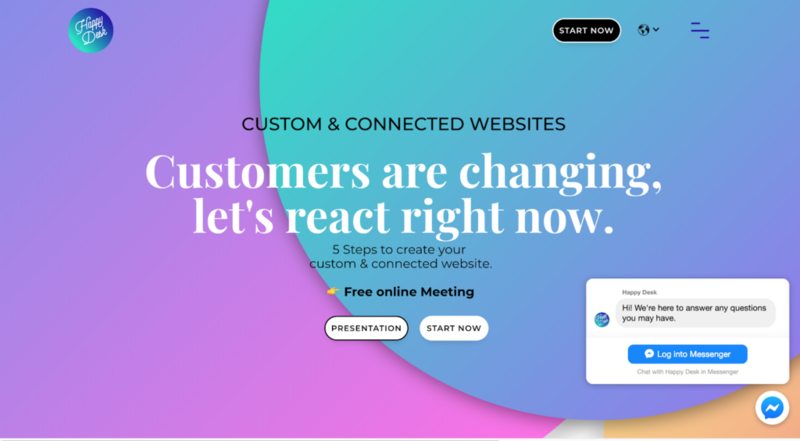 Webflow – Kevin is such a big advocate of using Webflow to make and design websites that he’s even independently organized meetups in Belgium to share it with other freelancers and web developers. 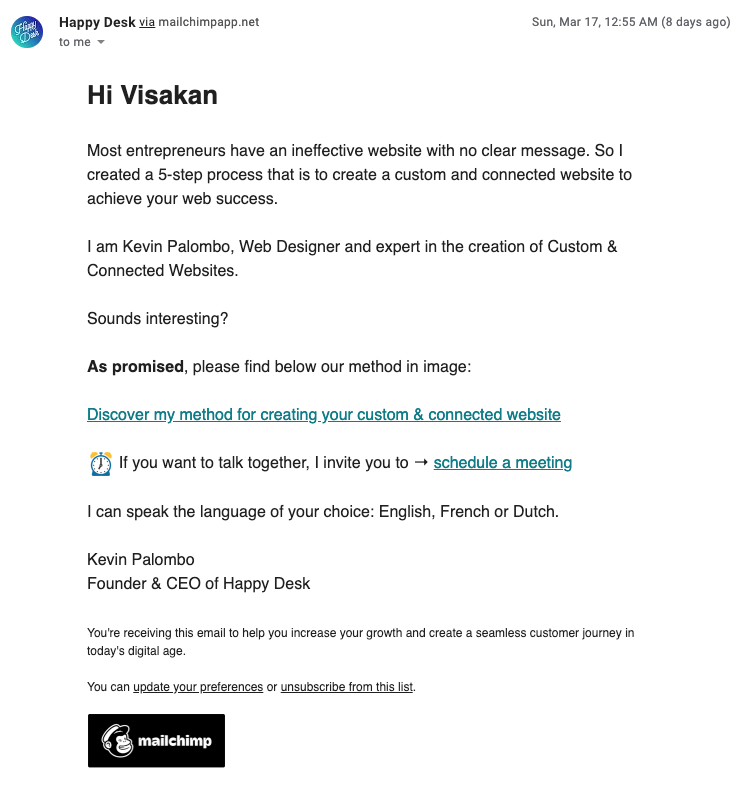 Mailchimp – Kevin started out using the free version of Mailchimp over 5 years ago. How did he decide to choose it? It had a free tier so it was easy to experiment with, it’s familiar, lots of people use it, it’s user-friendly and powerful. In my conversation with Kevin, I found it interesting and compelling how many times he used a phrase along the lines of, “if it makes my life easier, if it makes me more productive, I buy it.” Not all entrepreneurs are this comfortable spending money – but as we’ve established before, tools that save you time can end up saving you a lot of money. 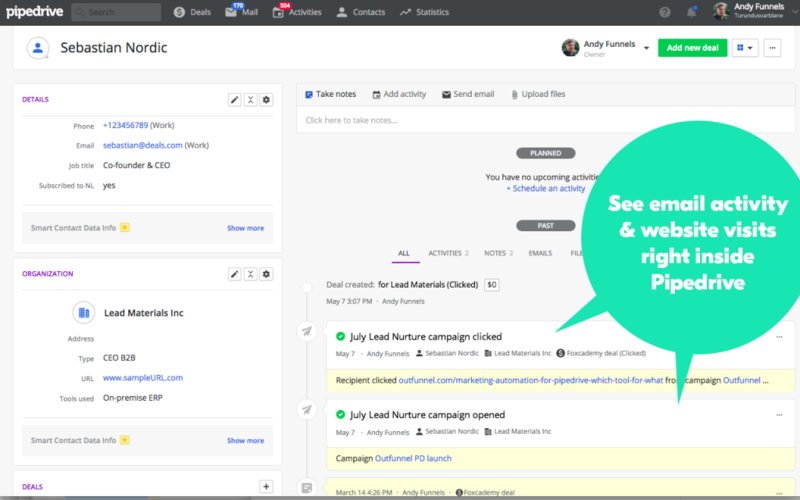 Tools like Pipedrive, Calendly and Outfunnel allow freelancers and solo entrepreneurs to get more automated leads, allowing them to focus on what they really love – doing great work and making a difference to their clients. Are you looking to automate your lead generation? Try Outfunnel free for 14 days to see how it can save you time and surface valuable information to your sales team!